Our product range includes a wide range of online cream separator 3000 lph and cream separator 1000 lph. Cream Separator Model AE- 2KL / AE- 3KL capacity 2000 / 3000 lph Hermetic Type. The Separator will be tri-purpose online with Built-In - outlet pump with 5 H.P. 3 Phase Electric Motor. SURYODAY Cream Separators is a market leader in the production of cream separators for their standard capacities and feeding dairy industry with around 3500 units annually. We ceaselessly strive to serve the dairy industry by bringing in state-of-the-art products at all scales. These separators are manufactured since 1983 .Our factory is equipped with Latest CNC machines and with Latest technological special tools and machines to make the world-class production. These separators have an evolved design after years and years of development, we take utmost care in the selection of the materials of construction and provide great details to every activity carried out at our workshop. Suryoday gear drive separators represent the ideal solution for the most demanding quality-oriented dairies looking for separation efficiency, ease of operation and limited maintenance requirement. Our separators are dynamically balanced by highly sophisticated balancing machine. All our Open Type offline separators give the highest efficiency of skimming i.e. 0.05% and with that, it will also provide polishing and clarification as to its standard performance. The machines are dynamically balanced and trouble free functioning. Lock Ring of the bowl is made of special Carbon Steel with anti-corrosive treatment. The separators are supplied with foundation shock observing pads, spanner sets, spare part set & oil lubrication for the Freecost . Bowl & all high-speed revolving components are dynamically balanced. All parts in contact with milk are made of Stainless Steel AISI 304. 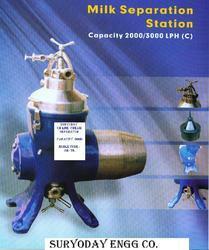 Cream regulator device is equipped with each machine. Standardization device is available as optional . Lock ring of Bowl is made of special Carbon steel with anti-corrosive treatment. Centrifugal Clutch drive system for a smooth running of separator Heavy Cast Iron Base Frame. The separator is supplied with foundation shock observing pads, spanner set, Spare Parts Set & oil lubrication for the first charge. Cream separator with manual sludge discharge is designed for separation of whole milk into cream and skim milk with simultaneous cleaning from impurities. The separator can be supplied with milk standardization device. Looking for Online Cream Separators ?